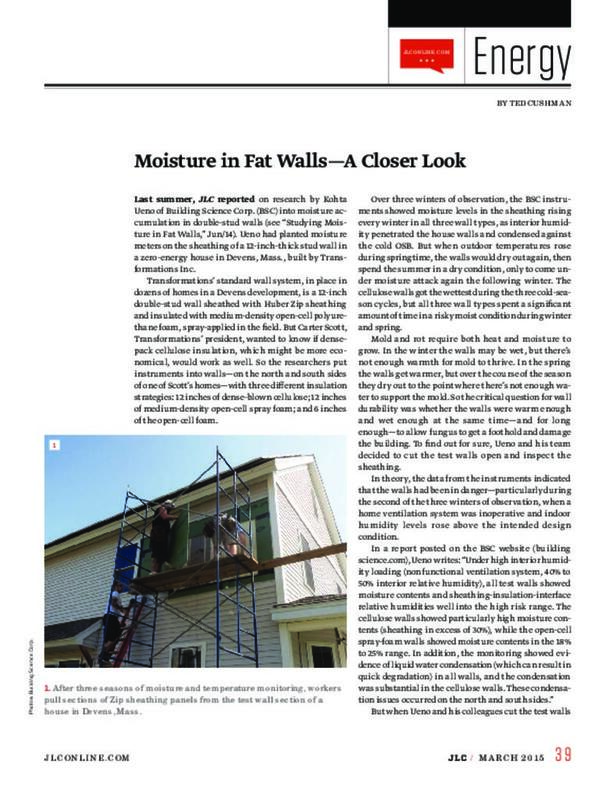 Last summer, JLC reported on research by Kohta Ueno of Building Science Corp. (BSC) into moisture accumulation in double-stud walls (see "Studying Moisture in Fat Walls," Jun/14). Ueno had planted moisture meters on the sheathing of a 12-inch-thick stud wall in a zero-energy house in Devens, Mass., built by Transformations Inc.
Transformations' standard wall system, in place in dozens of homes in a Devens development, is a 12-inch double-stud wall sheathed with Huber Zip sheathing and insulated with medium-density open-cell polyurethane foam, spray-applied in the field. But Carter Scott, Transformations' president, wanted to know if densepack cellulose insulation, which might be more economical, would work as well. So the researchers put instruments into walls—on the north and south sides of one of Scott's homes—with three different insulation strategies: 12 inches of dense-blown cellulose; 12 inches of medium-density open-cell spray foam; and 6 inches of the open-cell foam. Figure 1: After three seasons of moisture and temperature monitoring, workers pull sections of Zip sheathing panels from the test wall section of a house in Devens, Mass. Over three winters of observation, the BSC instruments showed moisture levels in the sheathing rising every winter in all three wall types, as interior humidity penetrated the house walls and condensed against the cold OSB. But when outdoor temperatures rose during springtime, the walls would dry out again, then spend the summer in a dry condition, only to come under moisture attack again the following winter. The cellulose walls got the wettest during the three cold-season cycles, but all three wall types spent a significant amount of time in a risky moist condition during winter and spring. Mold and rot require both heat and moisture to grow. In the winter the walls may be wet, but there's not enough warmth for mold to thrive. In the spring the walls get warmer, but over the course of the season they dry out to the point where there's not enough water to support the mold. So the critical question for wall durability was whether the walls were warm enough and wet enough at the same time—and for long enough—to allow fungus to get a foothold and damage the building. To find out for sure, Ueno and his team decided to cut the test walls open and inspect the sheathing. In theory, the data from the instruments indicated that the walls had been in danger—particularly during the second of the three winters of observation, when a home ventilation system was inoperative and indoor humidity levels rose above the intended design condition. In a report posted on the BSC website (buildingscience.com), Ueno writes: "Under high interior humidity loading (nonfunctional ventilation system, 40% to 50% interior relative humidity), all test walls showed moisture contents and sheathing-insulation-interface relative humidities well into the high risk range. The cellulose walls showed particularly high moisture contents (sheathing in excess of 30%), while the open-cell spray-foam walls showed moisture contents in the 18% to 25% range. In addition, the monitoring showed evidence of liquid water condensation (which can result in quick degradation) in all walls, and the condensation was substantial in the cellulose walls. These condensation issues occurred on the north and south sides." But when Ueno and his colleagues cut the test walls open to examine the sheathing after three seasons of monitoring, the results were surprising. MORE ROBUST THAN YOU WOULD THINK What explains the surprising lack of damage? Ueno says, “Joe [Lstiburek, BSC’s founder and principal] has said for years that building assemblies are more robust than we give them credit for. This is a solid demonstration of that fact.” But the BSC researchers are not sure themselves exactly why a stud wall that should theoretically be damaged by fungus shows no sign of any fungal attack. Figure 2: The wall system has good drying potential to both the inside (through the painted drywall) and the outside (through the permeable Zip sheathing), but the cold OSB on the exterior does suffer increased moisture and condensation during the coldest months of the winter; Figure 3: Moisture sensors in the building walls allowed the Building Science Corp. research team to remotely measure and record the moisture content of the framing and sheathing throughout three winters of house operation; Figure 4: Nails rusted slightly after three seasons of moisture accumulation—clear physical evidence of moisture attack, but not as grave as the data had suggested; Figure 5: A close-up of the OSB sheathing removed from contact with the low-density spray foam of the insulated wall cavity shows no sign of fungal attack at all, much less any deterioration that might compromise the sheathing’s function. Protective mechanisms. In a section of the report titled “Protective Mechanisms,” Ueno considers the possibilities. “What the cellulose guys say, and what I’ve seen too, is that cellulose does a nice job of protecting whatever it’s in contact with,” Ueno told JLC. “I know that the cellulose guys sometimes over-sell it, but the bottom line is, there is a lot of truth to that.” . . .